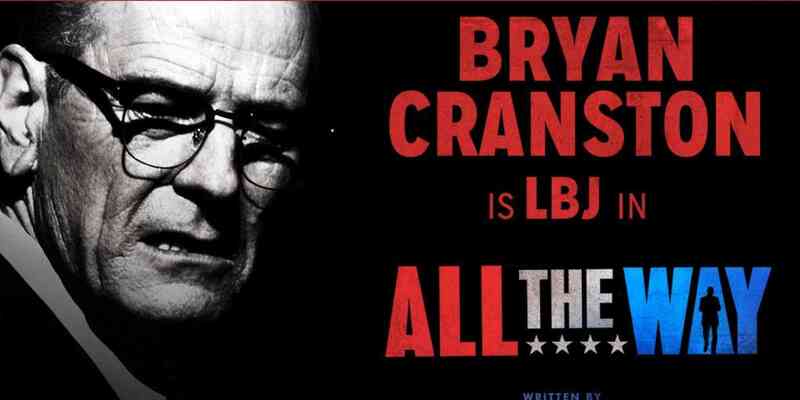 All the Way (2016) is an adaptation of Robert Schenkkan‘s Tony-award winning play about Lyndon B. Johnson. The casting is superb. Bryan Cranston has a way of consuming a role to such depth that it becomes him. Having the knowledge of seeing Oliver Stone‘s JFK and the suspected conspiracy to get Johnson to the White House puts watching this HBO film in an interesting light. It seems rather telling that given the bigoted language that was bandied around the Oval Office that a picture of Andrew Jackson would be backdropped in many of the scenes. Jackson served as the seventh president and founded the Democratic Party. However, his notorious history includes the fact he owned slaves and signed the order to wage genocide on the Indian population. With all the ugliness we see behind the scenes of the White House, the film also focuses on the skill and artistry of how political postering and lobbying gets things done. The setting of the movie begins at the moment President John F. Kennedy dies in the hospital and circles around the passing of the Civil Rights Bill. Martin Luther King is a key figure for the bill. The movie also showcases the similarities between King and Johnson and the fight they have with their prospective people to get onside to get the bill passed. At the same time, J. Edgar Hoover goes rogue to try and take King down on his own. This well worth the time to watch, especially if you are a history buff, or just like to see Bryan Cranston wave his acting magic. I give this five out of five stars. This entry was posted in adaptation, Based on a true story, Bryan Cranston, Drama, HBO, movie review, movies, political drama and tagged adaptation, Anthony Mackie, Bryan Cranston, Civil Rights Bill, debbie elicksen, HBO, jennifer miller-bender, Lyndon B. Johnson, movie reveiw, movies, our movie talk, political drama, politics, United States President by admin. Bookmark the permalink.